39,275 views Published on April 29, 2004 in Review. 0 Comments Tags: Article, David Pizzanelli, Digital Holography, Direct-write. Following just a few simple rules anyone can shoot a parallax sequence on film or video that can be directly converted into a hologram image. The first consideration is that the motion must be going in the correct direction in order to yield positive stereoscopic parallax in the hologram. The reason for this is very simple: one’s left eye must be presented with the left image and the right eye must see an image in the sequence that is to the right of the first image. This is true throughout the parallax sequence, thus if image #12 is seen by the left eye then the right eye must be observing an image that is to the right, such as image #20. If the order is reversed, then the left eye will be seeing a frame that should be seen by the right eye (and vice versa) and the three-dimensional image will be pseudoscopic, i.e. spatially inside-out, with the background seeming to be in front of the foreground subject. 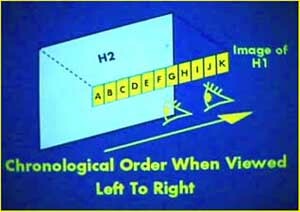 Luckily with the aid of a computer and video-editing and image manipulation software is it possible to re-arrange the order of the sequence, in the event that the parallax is going in the “wrong” direction, but it is a lot easier to film it correctly in the first place, so that the hologram image is orthoscopic. This is achieved by having anti-clockwise camera motion when orbiting the scene, or left-to-right camera motion when making a lateral pass by the subject. Alternatively, orthoscopic parallax is produced by having the subject move right-to-left or rotate clock-wise on a turntable in front of a fixed camera . Footage that dates back to a previous century can now be digitally manipulated to extract the temporal parallax information that it contains and to translate it to stereoscopic parallax to produce a three-dimensional image. Where as the subject moves laterally past the camera or rotates the footage will have some parallax that can often used to create a three dimensional image. To create a three-dimensional portrait just a few frames of temporal parallax are required. Where elements in the scene do not move, such as the background, they can be digitally removed and a new background with parallax inserted. Once a sequence of images from movie film or video has been digitized it can be manipulated in several ways: to eliminate parts of the image, add new elements, modify size or shape discrepancies, create new intermediate frames between key frames, or even create synthetic 3D from 2D images. As well as live-action films, temporal parallax is now common in animated feature films like “Toy Story”, “Shrek”, “Monsters Inc”, “Final Fantasy” and others where the animation is made using computer generated models rather than flat artwork. It is possible to have absolute control over the camera angles within the virtual environment, so adding temporal parallax to increase the realism is now commonplace. Likewise, in computer games temporal parallax has been found to increase the realism of games like “Tomb Raider”. Any animated character that exists as a computer models can be quickly and simply down-loaded to make a three-dimensional hologram image. The rules governing the use of computer models are the same as for deriving parallax from video or film, in that the model must be correctly moved with respect to the virtual camera. Computer-generated models are now part of the manufacturing process of a wide variety of commercial products, as well as architectural, aeronautical, pharmaceutical and medical imaging. From scanning electron micrographs of tiny particles of matter to the NASA images of alien worlds brought to us from outer space, parallax is everywhere and this revolution in digital imaging now permits the data to flow directly from the client’s computer to be be digitally written into a full-colour three-dimensional hologram. My sincere thanks to all the holographers working on dot-matrix and direct-write 3D imaging systems who helped me to compile the final sections of this paper by sending text, images and sample holograms. Your assistance was very much appreciated. Rob Munday private communication, e-mail rob@portraits.co.uk Spatial Imaging Ltd, Shepperton Studios, Shepperton, Middlesex TW17.